Chris Upton digs out a few of the best local history books for your delectation. It’s that time of year again when I dig out a few of the best local history books for your delectation. I’ve always enjoyed books which cross the genre divide, and lace their history with geography, literature or folklore. It feels more holistic somehow. I was very taken, therefore, by The Singular Stiperstones by Tom Wall, Orphans Press, Leominster, £18.00. Tom Wall has roamed this untamed part of Shropshire for a quarter of a century, and knows it like the back of his hand. Perhaps because the Stiperstones are more natural than man-made, their history reaches way back into geological time, and forward into legend and myth. Tom Wall explores what these craggy hills have meant to writers and artists (and tourists), as well as to those who have endeavoured to farm and manage them. Richly illustrated, this is a book with a real sense of place, and a landscape that is forbidding and alluring in equal measure. Inevitably, I suppose, the bookshops of 2014 have been awash with studies of the First World War, much as the airwaves have been. One or two ambitious publishers have planned whole series of books, each dealing with a different part of the country. From the Pen & Sword stable comes Michael Pearson, The Black Country in the Great War, Pen &Sword, Barnsley, £9.99, although I have been dismayed to see it discounted in Sainsbury’s by 50 per cent. Pearson takes a year by year approach to the combat, and concentrates most of his fire on the Home Front, and there are lots of intriguing details on the impact of the war locally. A major – indeed, culpable – drawback here is the lack of any references to sources, and the absence of any kind of bibliography. A significant opportunity to open up the records of the war to interested readers is thus missed. Amberley Publishing is engaged on a similar operation, covering the nation county by county, and is generally making a better fist of it. Worcestershire’s War, Amberley, Stroud, £14.99 is compiled by Maggie Andrews, Adrian Gregson and John Peters. You couldn’t ask for a better forward line than this. As the title implies, this book focuses on the primary evidence behind the conflict, as experienced by its participants, and drawing on diaries and letters, of course, but also on newspaper reports, council minutes and even school magazines to uncover life on the Home, as well as on the Western, Front. What the authors are doing here is guiding the reader through that evidence, revealing and interpreting it as they go. I particularly enjoyed the section on the aftermath of the war, and the conversation Worcestershire had with itself on how to commemorate those four unprecedented years. For the past 12 months Peaky Blinders has been gripping TV audiences. Currently resting between series two and three, Steven Knight’s brooding and often brutal account of a Small Heath family and its upward climb towards respectability has done for Birmingham history what the Wild West did for the States. As historical adviser on the first series, I’ve been bombarded with questions about its authenticity and accuracy, which in some ways misses the point. 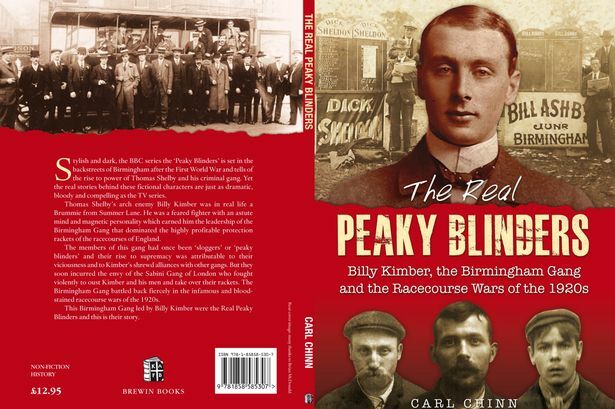 Nevertheless, I can now direct enquiries to Carl Chinn’s new book, The Real Peaky Blinders, Brewin Books, Studley, £12.95. Though touching on the Peaky Blinders’ origins in the “slogging” gangs of the late 19th century, Carl homes in on the book-making wars of the 1910s and 1920s, when gangs from Birmingham and London really did carve out the country between them. It’s a graphic account of a dark corner of the city’s modern history. There’s no Tommy Shelby here, of course, but plenty of others who could easily stand in for him. It would be easy to miss David Bruce, Greatrex. Forger &Photographer, Edinburgh, Renaissance Press, £9.99. Not only is this the product of a small Scottish press, it’s not a book I’ve come across in any West Midlands bookshop. The author happens to be a former director of the Scottish Film Council and the Edinburgh International Film Festival, so this a new venture for him into the world of Victorian history. But like a good film director, David Bruce follows the unsavoury and swashbuckling path of his subject from England to Scotland, from Australia to New York, and finally (spoiler alert here) back home to Glasgow to face trial. The local connection ? John Henry Greatrex was born in Sutton Coldfield (I think on the Lichfield Road) in 1827, and though his criminal career took him far and wide, we can add his name to the catalogue of great Birmingham counterfeiters, of which there were many. But, while most forgers were modest, back-street craftsmen, John Greatrex was the flamboyant archetype of the master-criminal. Zealous lay-preacher, jobbing actor and pioneering photographer, Greatrex turned to the dark side, and used his photographic skills to counterfeit bank-notes. There follows a gripping tale of crime and detection. And so, whether you’re considering a walk on the Shropshire wild side, a night out with the gang or a spot of forgery, let me wish you all a peaceful Christmas and happy reading into 2015.